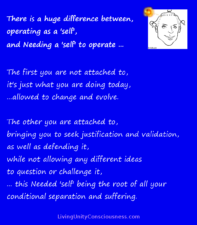 →Are You Attached to a Self? Your “self” is your I Am this and that which you are currently operating as, in this moment. 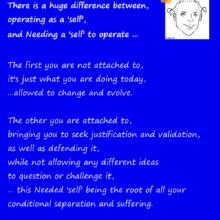 It can and does change and evolve constantly unless you become attached to a specifically defined iteration of this “self”. Which then leads to your EGO helping you to feel good about your current “self” through seeking validation, justification, and then defending it, all while keeping you away from the discomfort of anything that may chanllenge it … even if it is you considering a new and different idea or concept. John, why does this Consciousness identify with this specific person that is me? Why did this Consciousness emerge in this specific space and time and why is it experiencing the Existence through my senses and thoughts? I often fell solipsistic when I think about this questions because, if this Consciousness “choose” to identify with this self that I call “I”, how can be other Consciousnesses currently identifying with other selfs, all of them at the same time?